John Tilley, a shopkeeper in the High Street, sold a tincture to the townsfolk of Steyning in the late 18th century which would surely have rivalled Lily the Pink’s ‘medicinal compound, most efficacious in every case’. It was called Mr. Jackson’s Tincture (at one shilling a bottle) and was claimed to be 'an effectual remedy for the Gravel, Cholic and the Griping of the Guts, in which last it seldom fails giving ease in a few minutes. ‘Tis very efficacious in Coughs and Asthmas . . . and an immediate Cure for the Piles. For Burns, Scalds Bruises and Wounds there cannot be a better Remedy . . . It has been applied with surprising success for Rheumatik Pains, cramps or Wither’d Limbs. It cures the Tooth-Ach, whitens the Teeth and hath been found to be of the greatest service in dangerous disorders accidentally happening to women after Lying-in. ‘Tis equally efficacious in the several disorders to which Cattle are subject.' It must have been powerful stuff. One thing the tincture did not claim to cure was smallpox – though John Tilly had another ‘never-failing wash’ to offer, which was claimed to deal with 'Scurvical Itchings and foul Eruptions' among other things. Smallpox was still a virulent killer in the early part of the 18th century. When John Andrews, a patten maker of Steyning, fell ill with it in 1723 he made his will and was banished to the Pest House, a small building at some distance from the town where he could live out his few remaining days without contaminating the rest of the community. In the same month that John Andrews was consigned to the pest house 'the smallpox being in Steyning' was used as an excuse by the Reverend John Gray from Southwick to defer coming here to pay his debts. The Pest House burnt down in the mid 19th century and was not rebuilt: the site reverted to grassland and was eventually built over by Penlands. Mr Penfold, who treated the boys, was an apothecary. He would have bought the powdered smallpox scabs to apply to their skins and then charged his patients. It was known as 'buying the pocks'. A Mr. Sampson of Ditchling charged patients as much as four quineas for a course of treatment. Mr. Penfold’s son is better known to us as the Reverend John Penfold who became vicar of Steyning in 1792 but, on the occasion of his induction, the Hampshire Chronicle reported that he too had been 'for many years an apothecary and man-midwife'. 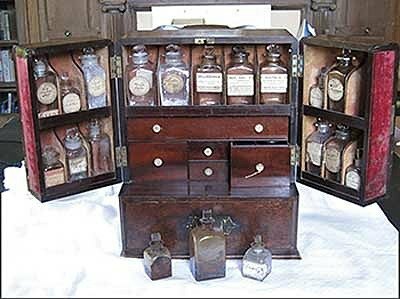 He would have been familiar with John Tilley’s range of medicaments – Mr. Jackson’s Tincture, the Never-Failing Wash, Dr. Ratcliff’s Purging Elixir and, presumably, Dr. Hooper’s Female Pills. Maybe ‘The Scaffold’, when they wrote and sang ‘Lily the Pink’, were thinking of these 18th century remedies with their exaggerated claims.